To be totally honest the little visitor was hanging out in the basement. My shop is upstairs but the table saw lives in the basement so I guess it counts as part of the shop. Our home is a 100 year old farm house with what is called a Michigan basement; a simple basement with stone and mortar walls that leak like a sieve. I had just ripped a set of dulcimer sides to height and noticed this little critter next to me on the floor. I ran upstairs for the camera and took this picture. The little critter did not like that and with each click of the camera it lunged at me. Fortunately for me this snake was only about 7 inches long! As an afterthought I wished I had put my six-inch ruler in the photograph but now I can brag and tell fish stories about the snake I found in the basement. 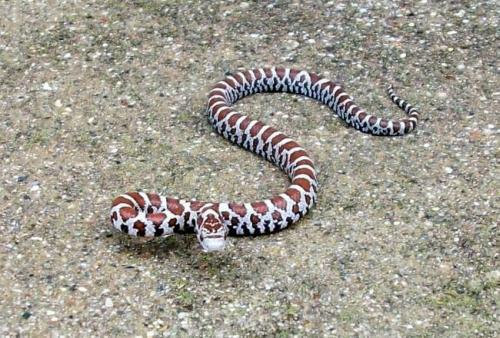 After catching him and letting him go in a nearby field I did some research and I think it was an Eastern Milk Snake. My wife and I thought that a few in the house would help keep the mice down in our house too! We could use a few of those milk snakes at our house since we have a problem with mice every winter. Our two dogs are worthless mouse-hunters! We haven’t seen a mouse in the house for a while though it is often an ongoing project keeping them out. This little snake must be pretty young. I wonder if there are relatives lurking about. He’s beautiful. Glad that the encounter went fairly well. I’m sure he’d just as soon not be sharing space with you, huh?